Welcome to Board Watch for WCCUSD’s March 16th Meeting! At this week’s meeting, the West Contra Costa Unified School District Board of Education heard an update presentation on the English Language Development Program and voted to approve the district’s individual school site 2015-16 Single Plans for Student Achievement. Dr. Allison Huie, Coordinator of English Learner Program, presented the board with an update on the district’s different English Learner programs, services, and assessments, shared elementary and secondary data, and invited staff to speak on implementation of programs and services at individual school sites. Kindergarten and 1st grade students are assessed on listening and early literacy reading comprehension, while 2nd-6th grade students are assessed on listening, reading, and writing. The data set pictured below shows that the proportion of students meeting or exceeding standards (green) is considerably higher in K-1st than in higher grade levels. Dr. Huie remarked that this discrepancy can be attributed to the fact that beginner language learners typically quickly acquire the simple skills and knowledge for early literacy; in addition, she remarked that this could also be the result of stronger Transitional Kindergarten programs better preparing incoming Kindergarteners for success in literacy. The desegregated data shows that students in Grades 2-6 are performing better in reading than they are in listening and writing. To address this issue, the district has implemented various supports and services, including a writing workshop professional learning series that equips educators with the tools to effectively guide students from spoken to written language. Assessment items are grouped into two categories: reading and literature, and writing. 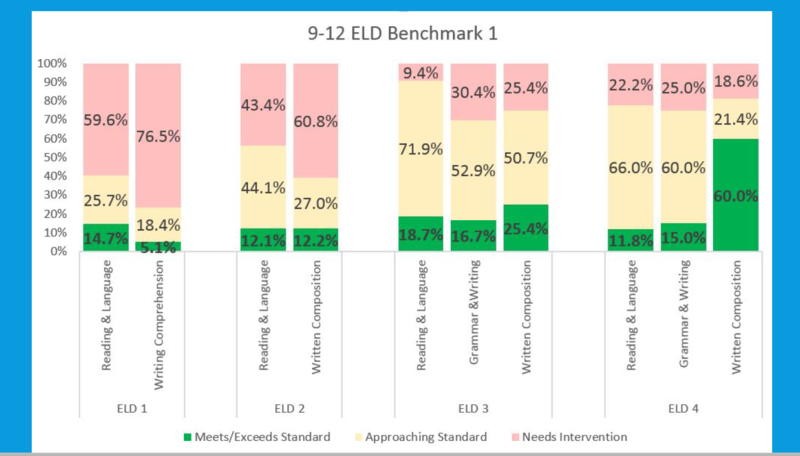 The data set below shows that the proportion of students approaching or meeting/exceeding standards (yellow and green) is greater as students reach higher levels of English Language Development (1-4). Across all ELD levels, the data shows that our English Learners’ writing skills are less developed than their reading & language skills. The district is supporting school sites and classroom teachers to utilize Illuminate, a powerful tool that allows teachers to dive deep into the data about how their students performed — down to the types of questions individual students struggle with — and efficiently identify which students are ready to tackle more advanced material, which students are almost there, and which students need additional supports or interventions. Like the 6-8 assessments, 9-12 ELD assessment items are grouped into two main categories: reading and literature, and writing. 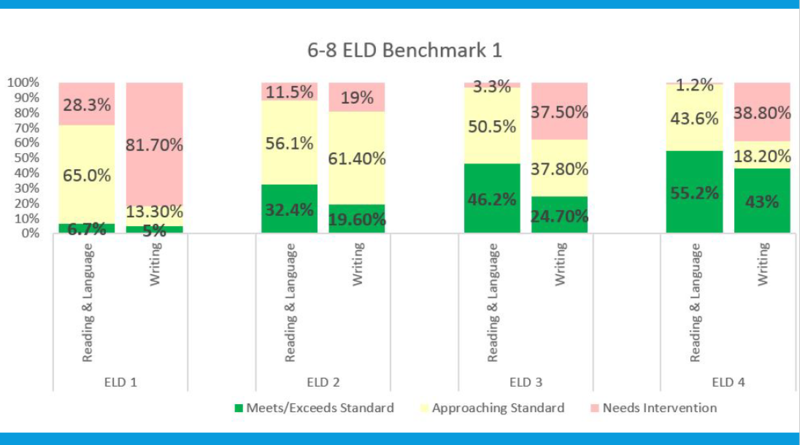 The data set below shows that the proportion of students approaching or meeting/exceeding standards (yellow and green) is greater as students reach higher levels of English Language Development (1-4). 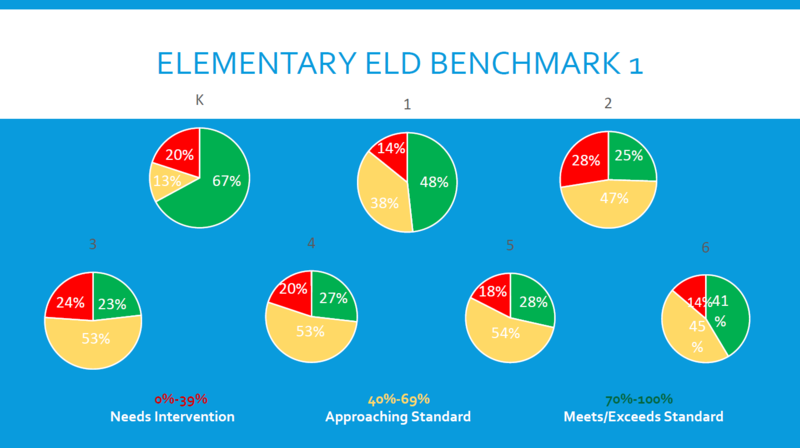 Dr. Huie highlighted the spike in the proportion of students meeting/exceeding standards in ELD 4, explaining that most ELD 4 students have had significant amounts of practice by the time they reach this level, and, through enrollment in another on-level English class, are exposed to additional materials and methods of learning and mastering the language. The district hosted writing score calibration workshops to ensure that school sites and teachers were applying the rubric in alignment. 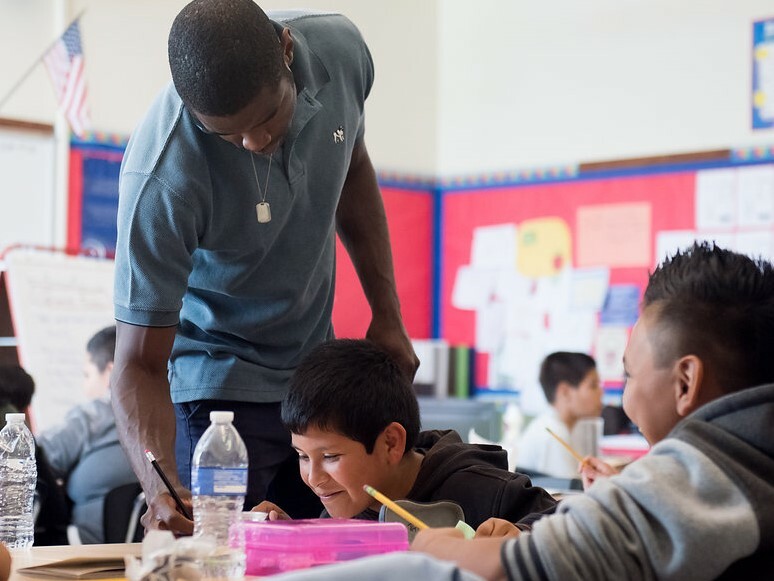 In addition, the desegregated data shows that students in ELD 3 and 4 need additional support with grammar and revision-type questions, which are a reflection of new curriculum materials and question types on the SBAC. The district has been supporting teachers through professional development opportunities. Curriculum Development. The district continues to implement the new secondary curriculum through student and teacher access to a full host of digital resources, in addition to online state standards-aligned testing experiences for grades 3-12 and the development of newcomer pilot program proposals for the upcoming school year at Helms MS and Richmond HS. Engaging Stakeholders. The program provides financial support for teachers, parents/family members, and other community members to attend the California Association of Bilingual Educators conference this March. The program also collaborates with WCCUSD’s Community Engagement department to improve the processes and procedures around the Home Language Survey. There are plans in place to provide an informational video in multiple languages to assist families and share context on their child’s language learning experience. Compliance and Accountability. In addition to gathering data and supporting schools to meet standards, regular site visits are made to check in on classrooms and teachers. Professional Development. The program has offered more than 40 professional development sessions this year, totaling more than 150 hours of training to staff who support English Learners. This semester, the program began engaging teachers and administrators to dig into our state’s ELD standards through the CA Department of Education’s online tools. Click here to view the full English Language Development Program Update Presentation. The Single Plan for Student Achievement (SPSA) serves as an academic roadmap to improve student achievement at individual school sites. It also includes a description of how school site supplemental, concentration, and Title I funds are used to support efforts around student achievement. Training and support are provided to assist school sites in using the SPSA template, analyzing data and completing the SPSA. The plans are developed and approved by the School Site Councils (SSCs). The board voted unanimously to approve the SPSAs. Click here to view our district’s individual school site 2015-16 SPSAs. Click here to view the full Single Plan for Student Achievement presentation.